From our independent, biomedical electronics engineering design and stimulation waveform technological advances, compared to the earlier Liss devices (designed 1980-1990), the LVtC Stimulator delivers a higher precision stimulation waveform. 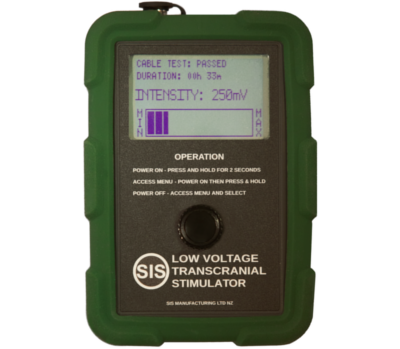 The LVtC Stimulator is the first waveform-generating cranial electrical stimulation (CES) device that achieves comparative or greater, known CES therapeutic effects, with extremely low applied stimulation electrical voltages (1000× lower) in the milli-volt range. Neurotransmitters are a class of the body’s chemical messengers. 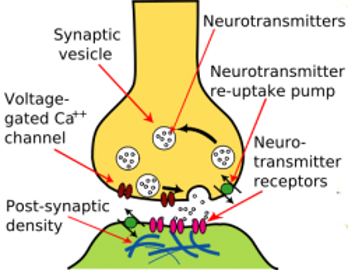 They are the molecules used by the nervous system to transmit messages between its nerve cells (‘neurons’), and from neurons to muscle cells. Neurotransmitters influence neurons in excitatory, inhibitory and modulatory ways. Neurotransmitters control and influence many major body functions including breathing, heartbeat, movement, emotional response, concentration, mood, feelings of pleasure and satisfaction, and pain signal transmission and perception. The LVtC Stimulator influences nerve activity by delivering electrical energy, in the form of specific frequencies, to the brain. The electrical energy penetrates into the brain via a specially, amplitude ‘modulated’ waveform, which acts as a ‘carrier’ of the actual stimulation frequencies. To achieve this carrier function, the modulated waveform is specially designed to utilize to advantage the composite electrical properties (impedance) of the bones of the skull, to transmit the stimulating electrical energy. The published CES and Liss Modulated Electric Energy Stimulator research shows strong beneficial alteration of the levels of neurotransmitters: serotonin—related to mood, sexual function, appetite, sleep, memory, learning and some social behavior, melatonin—related to sleep-wake cycles, beta-Endorphin & GABA—related to transmission and sensation of pain, and on cortisol and DHEA—adrenal stress and steroid hormones, measured in the cerebral spinal fluid in the brain and spinal cord, and in the bloodstream. Also designed for brainwave augmentation, the LVtC Stimulator delivers stimulation frequencies that are in the Beta brainwave band. 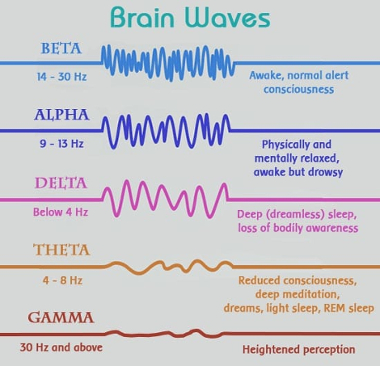 Beta brainwaves are associated with the normal, waking state of consciousness of focused activity, decision-making and general alertness. Modulated electric energy stimulation—under the category of cranial electrical stimulation (CES)—is backed in the USA by 30+ peer-reviewed published studies, around 20 patents, and by the USA Food and Drug Administration (FDA) and Health Canada marketing clearance for the treatment of anxiety, depression, and insomnia disorders. Applications are drug free and no negative effects or major contraindications have been reported from the use of amplitude modulated frequency CES. Neurosurgeon, C. Norman Shealy used the first implantable neuromodulation electrotherapy device for the treatment of chronic pain in 1967. Later on, he found that the same effects could be achieved via non-invasive electrical stimulation. The original Modulated Electric Energy Stimulator technology was gradually developed and patented beginning in the 1980s by scientist and medical engineer, Dr Saul Liss (-2006) together with Shealy. Up until now, most currently available, both alternating current (AC waveform) and direct current (DC), cranial electrical stimulation (CES) devices have used relatively high stimulation voltages applied to the brain—typically 20-30 volts. Most of this delivered electrical energy is unnecessary to achieve strong therapeutic effects. Dr Liss knew this and orignally developed much lower voltage devices; he only added the higher voltages in order to convince people that they worked as they could then feel the stimulation. From our independent biomedical engineering R&D, in parallel with the experiences from an ongoing, dedicated electromedicine clinical practice, we have developed on the Liss and other existing waveform cranial electrical stimulation (CES) technologies, to advance the field of CES and produce the world’s first Low Voltage transCranial (LVtC) Stimulator. The LVtC Stimulator maintains or enhances the established therapeutic effects of CES, while very dramatically reducing overall user exposure to electrical energy.